The bizarre "chemical attack" in Salisbury, England, blamed on Russia by the UK, seems like a chapter intended for Syria rather than Britain. Because it is. Had the chemical attack not been reported in Salisbury, it would have been reported in Syria a few days later. It may yet happen in Syria too. Clear signs are being ignored by UK politicians in their patriotic dash to blame the Russian "enemy". The signs show the British government accidentally released the nerve agent in its own territory prematurely, while hoping to commit an atrocity using it in Syria. The nerve agent was being transported by so-called "targeted" UK spy Sergei Skripal and his daughter. The Russian former double agent's daughter Yulia, likely as involved with UK intelligence agencies as her father, seems to have been carrying the nerve agent in her suitcase at the time of the apparent "attack". That much is already confirmed by, basically, all the media. The nerve agent actually seems to have been destined for Eastern Ghouta, Syria, which would inevitably require spies (or expendable mules) to deliver it in a rather risky operation. We know the UK was trafficking weapons from Salisbury to Eastern Ghouta, Syria, to support Syrian rebels. Recent video footage of captured munitions in Eastern Ghouta shows that some of the munitions' origin was Salisbury, England. * Such a finding offers strong grounds to suspect at least some link between the events in Salisbury and the events in Eastern Ghouta, Syria, where Syrian President Bashar al-Assad is routinely accused of using poison gas by the British and American governments. The British and American governments are in turn accused of staging false flag attacks as they seek excuses to launch airstrikes on Syria, making it likely that this was their plan once again. There is already a history of bungled attempts to move chemical weapons into Syria and give them to rebels to frame Assad, and this just looks like one more example of it. In 2013, the big year the US first threatened to attack and overthrow Assad for supposedly using chemical weapons, anti-Assad rebels backed by the West were arrested in Turkey with chemical weapons. There is no motive for Britain or Russia to carry out a military grade nerve gas attack in Salisbury, and Sergei Skripal and his daughter were not important enough to be targeted by either country, but they were expendable enough to be used as mules. The only reason this chemical "attack" would occur is by mistake, as it fits neither country's agenda. The current diplomatic crisis, which serves neither Russian nor UK interests, can't have been premeditated by the UK. It does not serve the US and NATO foreign policy aims, which are heavily focused on chemical attacks and escalating violence in Syria rather than in Britain. Nothing demonstrated this clearer than when US diplomat Nikki Haley tried to conflate the events in England with the events in Syria and advocate increased US violence in Syria while talking about Salisbury. 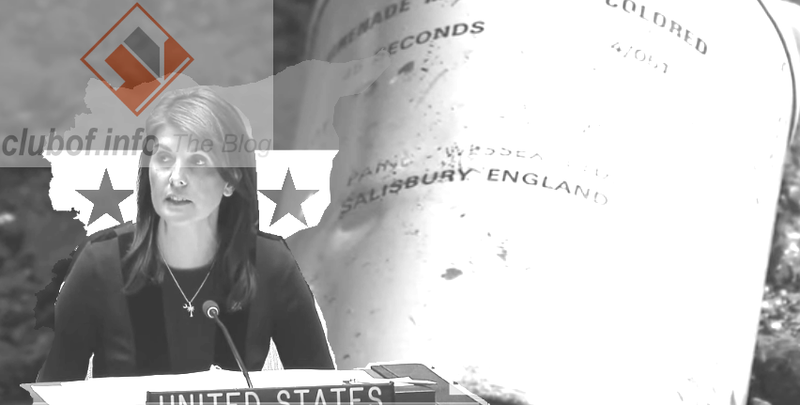 Haley talked about Syria and Assad around ten times in the course of a few minutes in front of the UN Security Council after being asked to talk about Salisbury, as she fumbled papers that apparently focus on Syria. The plan was for this chemical attack to happen in Syria. The US had its script so well-prepared to talk about it happening in Syria that it didn't even bother to rewrite it much. It is a distinct possibility that, in their desperation to avoid mockery by Russia for accidentally gassing themselves while trying to frame Assad, the British government suddenly decided to start assailing Russia with allegations, hoping for a spectacle that might hide their incompetence. Of course, we don't know for certain what happened in Salisbury. Almost no-one you talk to in Britain believes Putin really did a chemical attack in Britain. It is just too ridiculous to believe, so it makes sense to offer a more rational alternative version of events.